For quantitative determination of L-Alanine and evaluation of drug effects on alanine metabolism. • Sensitive and accurate. 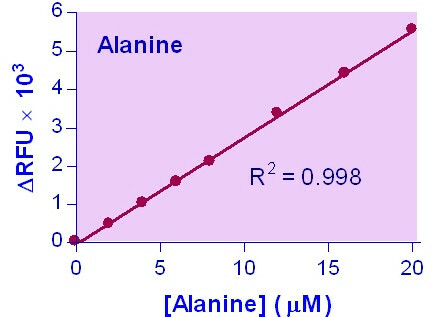 Linear detection range in 96-well plate: 1 to 200 μM alanine for colorimetric assays and 0.4 to 20 μM for fluorimetric assays. ALANINE , a nonessential amino acid, is utilized in the glucose-alanine cycle between tissues and the liver. In tissues that metabolize amino acids, amino groups are collected as glutamate by transamination. The amine group is then transferred by alanine transaminase (ALT) from glutamate to pyruvate to form alanine and a-ketoglutarate. The alanine generated is transported to the liver where a reverse ALT reaction occurs and pyruvate is regenerated. Pyruvate is converted through gluconeogenesis to glucose which can then be recirculated to the tissues. Alanine concentration may have some correlation with high blood pressure, energy intake, cholesterol levels and body mass index. BioAssay Systems’ Alanine Assay Kit provides a simple, direct and automation-ready procedure for measuring alanine concentration. Alanine is converted into pyruvate which can then be directly measured. The color intensity of the reaction product at 570nm or fluorescence intensity at λex/em = 530/585nm is directly proportional to the alanine concentration in the sample. Applications For quantitative determination of L-Alanine and evaluation of drug effects on alanine metabolism.